Today is the official release day of The Human Alchemy. Some people who preordered direct from Word Horde have received their copies a few days early, and I’ve really enjoyed seeing photos of those paperbacks (and in one case, a Kindle screen) posted on Facebook, Twitter and Instagram. I’m not sure why, but somehow seeing the book in the hands of a specific reader makes the connection seem so much more real than when someone just says “I bought a copy.” All the support is appreciated! Earlier in the week I posted direct links to where the book could be ordered, including Word Horde, Amazon, Barnes & Noble, Kobo and IndieBound. This week The Human Alchemy will be out… well, this weekend, at least. Official release date is June 30. So then, assuming you want to get your hands on a copy, where can you get it? Here are some ideas. There will probably be others soon, but that’s the list as of now. I very much appreciate the support of everyone who orders a copy! My very fine publisher Word Horde has just come out with a couple of eye-catching promotional bits for my upcoming collection, The Human Alchemy. It’s wonderful to see Word Horde doing these super-cool, inventive bits to help spread awareness of the books! My first short fiction collection The Lure of Devouring Light was released just short of two years ago by Word Horde. I still vividly recall seeing for the first time the beautiful cover art Jarek Kubicki and layout by Scott R Jones, and feel the cover is a wonderful complement to what’s inside. The book included a very nice introduction by one of my favorite writers, John Langan, and was overall quite well received. I obtained endorsements or “blurbs” from several more of my favorite writers, including Laird Barron, S.P. Miskowski, Michael Cisco and Jeffrey Thomas. I poured a lot of myself into that book, and I still feel it’s an expression I can be proud of. Though the news of my forthcoming second collection The Human Alchemy has emerged in hints and whispers over the past six months or so, I think I ought to make a proper announcement. I’ll have more details to share between now and the release date, and of course I’ll likely be sticking the book in everyone’s face (virtually, that is), more than they might care to see it, once released. For now, I’ll give you this. The Human Alchemy will be released in June, 2018 by Word Horde. Editor and Publisher Ross E. Lockhart has been a never-ending pleasure to work with, both a solid and serious professional when there’s business to be done, and great fun when it’s time for chatting about books or getting beers at a convention. I couldn’t have been happier with the whole process of putting out my first collection, and always hoped it would do well enough that Word Horde would want to do another. I will now have the honor of being the first writer to have two books on Word Horde. I’ll soon share the table of contents, information about the stories, the introduction, the blurbs, and eventually the cover art. Like the Beach Boys said in Surfin’ USA… Can’t wait for June! Elinor Phantom, Editorial Assistant at Word Horde, poses with the proof copy of THE LURE OF DEVOURING LIGHT. Looks good! The Lure of Devouring Light from Amazon in Kindle format or trade paperback. Official release date is April 30, 2016. 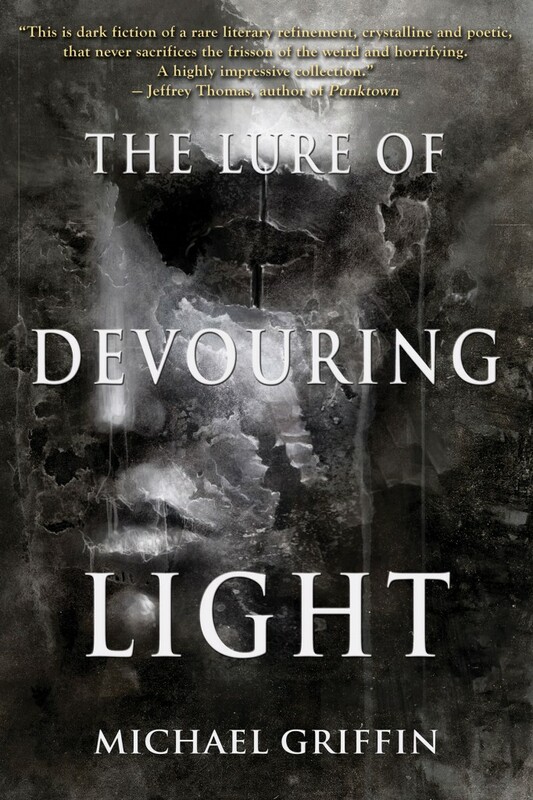 Yesterday Word Horde announced the planned release of my collection The Lure of Devouring Light for this April. Yesterday it became official, and known to many. I’ve known this was a “done deal” for quite some time, and didn’t for a moment doubt that Ross E. Lockhart would do what he said he would do… and yet, yesterday’s announcement was a relief to me, as well as a cause for excitement, for several reasons. There was the obvious pride and pleasure of seeing the announcement met with interest and enthusiasm. Hey, people want to see my book when it comes out! Some people are even pre-ordering it without having seen the cover. There was relief at being able to stop keeping the secret, especially from people I thought might be interested to hear it. Last October, Orrin Grey visited Portland for the occasion of his book release (Painted Monsters, which came out on Word Horde), which coincided with the H.P. Lovecraft Film Festival. Orrin stayed the night before the HPLFF began at our house. Lena and I and Orrin had a nice time, chatting at the Edgefield about horror movies. I wanted to tell Orrin “Hey, guess what? Looks like we’re going to share a publisher,” but the deal wasn’t final yet and I didn’t want to go around talking it up prematurely. There was the realization that now I get to share the wonderfully flattering blurbs I’ve received from four of my favorite writers. I’ll post these here soon. There was knowing that I would be seen differently by a lot of people who hadn’t previously read my work, but might now give it a shot, whether because of the endorsement of Word Horde or the kind statements of respected writers in the blurbs I just mentioned. The point of this isn’t “I want to be perceived differently,” but that I hope my work will reach more people in the future, and I think this book will really help that happen. Yesterday felt like a big deal. It was fun and exciting, and I have the sense the fun is just getting started. I’ll have lots to say between the time of this announcement and the actual release of the book, so this blog space will be much more active for a while.